← Plan to #KBtribechat Wednesday at #KBIS2015! A discussion in honor of the EPA’s #ShowerBetter Month hosted and sponsored by Ferguson. 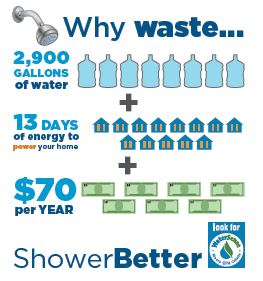 The U.S. Environmental Protection Agency is encouraging consumers to “shower better” this October by considering WaterSense® labeled showerheads as a way to save water and energy while ensuring a satisfying shower. The shower is where many Americans wake up in the morning or unwind after a long day, but it can also be a place where water, energy and money are sent down the drain. By replacing just one showerhead with a WaterSense® labeled model, EPA estimates the average family can save 2,900 gal of water, the amount of electricity needed to power its home for 13 days and more than $70 in energy and water costs every year. 1. What are some recent trends or customer requests when it comes to showering? 2. Can you immediately tell a shower client from a bath client? 3. Are your clients educated beyond a label when it comes to selecting plumbing products for their home? Are customers educated on what the WaterSense® label means? 4. In particular to showering – Are you still battling misconceptions around rainheads? What does it mean to have a low-flow showerhead? 5. Are environment-friendly labels driving your customers’ purchasing decisions when it comes to showering? 6.How do you balance local / state regulation with your client’s desire to have the ultimate showering experience? 7. How comfortable / receptive are your clients with technology in the shower? 8. What is the next step for clients who are receptive to / interested in making a environmentally-conscious decision when selecting showering product? What’s after WaterSense®?